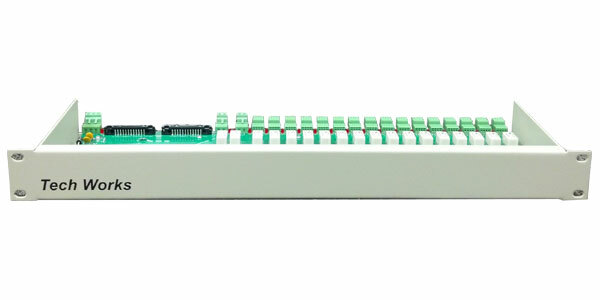 The ICR-116 series of Intercom Switching Relays are ruggedized intercom panels for use in harsh environments such as correctional facilities while providing high quality audio communication with complete control. Each unit provides connection for 16 remote intercom speakers with call in switch. The Call-In and Relay Control connections are 24 pin ribbon connectors. Dedicated connectors provide pull to common inputs from PLC for station selection and pull to shield outputs from station call switches. All Remote Station connections are via 4 pin 0.1 type connectors. A matching set of 4 pin 0.1 connectors is provided on the opposite side of the board for access to the normally closed relay contacts. By using the “Back Contacts” multiple masters or priority switching can be achieved. Euro style screw terminals are available for connection of power, intercom amplifier, and paging amplifier. Associated with each Station Selection Relay is a Station Status Indicator. The Station Indicators shows the Technician what relay or relays are active. The indicators are intuitive, and easily learned. Each Station Indicator is either Off or On. When an Indicator is Off there is no activity with that station. When an Indicator is On, that Station is selected for Communication. Or all Indicators will be On simultaneously during a Page. A 40 Watt Power Amp can be added for applications requiring more than 20 watts of all call power.